William Franklin Graham Jr. (born November 7, 1918) is a prominent career evangelist and an Evangelical Christian. He has been a spiritual adviser to multiple U.S. presidents and was number 7 on Gallup's list of admired people for the 20th century. He is one of the most prominent members of the Southern Baptist Convention. 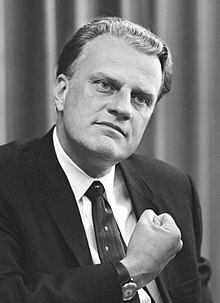 Born on a dairy farm near Charlotte, North Carolina, Billy Graham was raised in the Associate Reformed Presbyterian Church by his parents, Morrow Coffey and William Franklin Graham, and changed denominations to Southern Baptist in 1934 during a Christian revival meeting, conducted by Mordecai Ham. Graham was ordained a Southern Baptist minister in 1939. After graduating from Sharon High School in May 1936, Graham attended Bob Jones College (now Bob Jones University), then located in Cleveland, Tennessee, but found it to be extremely sectarian so he transferred to the Florida Bible Institute, now Trinity College of Florida, in 1937 and graduated from Wheaton College in 1943. It was during his time at Wheaton that Graham decided to take the Bible as the infallible word of God. Henrietta Mears  of the First Presbyterian Church of Hollywood was instrumental in helping Graham wrestle with the issue, which was settled at Forest Home Christian camp (now called Forest Home Ministries) southeast of the Big Bear area in Southern California. A simple memorial there still marks the site of Graham's decision. In 1943, Graham married Ruth Bell, whose parents were Presbyterian missionaries in China, where her father, L. Nelson Bell, was a general surgeon. He meet Ruth at Wheaton college: “I saw her walking down the road towards me and I couldn’t help but stare at her as she walked. She looked at me and our eyes met and I felt that she was definitely the woman I wanted to marry.” Today, Graham and his wife have three daughters (including Anne Graham Lotz, who runs AnGeL ministries), two sons (including Franklin Graham, who now administers his organization), 19 grandchildren and 28 great-grandchildren. While still a seminarian at Wheaton College, Graham served briefly as pastor of the Village Church in Western Springs, Illinois, not far from Wheaton, in 1943-44. While there, a friend of Graham's Torrey Johnson, pastor of the Midwest Bible Church in Chicago told Graham that his radio program "Songs in the Night" was about to be cancelled for lack of funding. Consulting with the members of his church in Western Springs, Graham decided to take over Johnson's program with financial support from his parishioners. Launching the new and revitalized radio program on 2 January 1944, still called "Songs in the Night", Graham recruited the baritone George Beverly Shea as his director of radio ministry. While the radio ministry continued for many years, Graham decided to move on in early 1945. Initially he intended to become a chaplain in the armed forces, but shortly after applying for a commission he came down with a severe case of mumps that diverted that plan. After a period of recuperation in Florida, Graham went on to cofound Youth for Christ with then-evangelist Charles Templeton. He traveled throughout the United States and Europe as an evangelist. Graham scheduled a series of missions in Los Angeles in 1949. The missions went on for 8 weeks after being originally scheduled for only 3 weeks. This happened on many other of his early missions. He had missions in London which lasted 12 weeks, and a New York City mission in Madison Square Garden in 1957 which ran nightly for 16 weeks. He also led a very successful crusade (the first of several) in Australia in 1959. This crusade was regarded as being the most effective preaching of the gospel in Australian history and its effects led to Protestantism growing consistently over the next 15 years and numerous new churches being founded. Many home Bible groups that were formed lasted 35 years or more. According to Ben Bagdikian's The Media Monopoly, Graham was catapulted out of obscurity by news moguls William Randolph Hearst and Henry Luce who thought that Graham would be helpful in promoting their conservative anti-communist views. Hearst sent a telegram to his newspaper editors reading "Puff Graham" during Billy Graham's late 1949 Los Angeles crusade. The result of the increased media exposure caused the crusade event to run for 7 weeks--4 weeks longer than planned. Luce also put him on the cover of TIME in 1954. Throughout his ministry, Graham enjoyed a reputation for holding crusades in places that other evangelists considered impossible. During the Cold War, Graham spoke to large crowds in countries throughout Eastern Europe and in the Soviet Union. During the Apartheid era, Graham consistently refused to visit South Africa until its government finally allowed visiting crowds to sit desegregated for his first 1973 crusade there. He also openly denounced Apartheid at the crusade. Graham is also one of the few preachers who has been allowed to speak in North Korea. Graham opposed segregation during the 1960s and often paid bail money to secure the release of Martin Luther King from several jails in the American South during the 1960s civil rights struggle. On June 24, 2005, Billy Graham began what he has said would be his last North American crusade, at Flushing Meadows Park in New York City. But, on the weekend of March 11–12, 2006 Billy Graham held the "Festival of Hope", together with his son, Franklin Graham. The festival was held in New Orleans, which was recovering from Hurricane Katrina. Over 1,360 were converted during the weekend event, supported by 215 churches across the New Orleans metro area. Graham said that his planned retirement was due to his failing health. He has suffered from Parkinson's disease for about 15 years, has had fluid on the brain, pneumonia, broken hips, and recently revealed that he is suffering from prostate cancer. In August 2005, a frail Graham appeared at the groundbreaking for his library in Charlotte, North Carolina. Then 86, the Rev. Graham was forced to use a walker to get around during the ceremony. On July 9, 2006, Graham spoke at the Metro Maryland Franklin Graham Festival, held in Baltimore, Maryland, at Oriole Park at Camden Yards. Billy Graham has preached Christianity to live audiences of over 210 million people in more than 185 countries and territories through various meetings including Mission World and Global Mission. Graham also reached hundreds of millions more through television, video, film, and webcasts. Billy Graham is best known for his evangelistic crusades. He began this form of ministry in 1947 and continued until recently. Most of the planning is now by his son, Franklin Graham and some youth crusades are by his grandson, Will Graham, but Billy often still speaks at them. He often rents out a large venue, such as a stadium, park, or street. He has a group of up to 5,000 people to sing in a choir and then preaches the gospel and invites people to come forward. These people, called inquirers, are then given the opportunity to speak one-on-one with a counselor who clarifies any questions the inquirer may have and prays with that person. The inquirers are often also given some resources such as a Gospel of John or Bible study booklet. Billy Graham has done over forty-one crusades since 1948. Politically, Graham has been a registered member of the Democratic Party, although in recent years he has adopted a flexible position, choosing to cast his vote with either party, depending on which he considers most appropriate at the time. He has had close relationships with Dwight Eisenhower, Lyndon B. Johnson, Richard Nixon, Gerald Ford, Bill Clinton, and the Bush family. He enjoyed extremely close relations with Nixon and brought to his 1960 campaign for president the strong support of Protestant evangelicals worried about the candidacy of the Roman Catholic John Fitzgerald Kennedy. After Nixon's 1968 victorious presidential campaign, Graham was an especially close advisor, often visiting the White House, occasionally leading the mostly private church services that the president organized there. Just two days before the 2000 presidential election, Graham spoke at a prayer breakfast in Florida with George W. Bush in attendance and stopped short of formally endorsing him. Nevertheless his words were widely viewed as an endorsement. It is true that many, many years ago Mr. Graham registered as a Democrat. However, throughout the years he has voted for the candidate he believes will do the best job. In other words, he has not voted a straight party ticket. Mr. Graham takes his responsibility to vote for the leaders of our country with the same prayerful seriousness that he takes other significant decisions. Mr. Graham has always maintained an optimistic attitude toward people. He seeks the good and emphasizes what is positive, even if he does not agree with them on many points, including moral or political issues. Mr. Graham's comments sometimes are not presented in the complete context in which they were made; while at other times, he himself would perhaps wish he might have phrased things a bit differently. However, he does not presently and never has condoned or defended immoral conduct. Mr. Graham's lifelong calling has been to proclaim the Gospel of our Lord and Savior Jesus Christ throughout the world. As you are aware, he has been faithful to this mission. He has not compromised his message. According to a 2006 Newsweek interview, "For Graham, politics is a secondary to the Gospel... When Newsweek asked Graham whether ministers — whether they think of themselves as evangelists, pastors or a bit of both — should spend time engaged with politics, he replied: 'You know, I think in a way that has to be up to the individual as he feels led of the Lord. A lot of things that I commented on years ago would not have been of the Lord, I'm sure, but I think you have some—like communism, or segregation, on which I think you have a responsibility to speak out.'" Graham has been very outspoken against communism and generally supportive of U.S. Cold War policy, including the Vietnam War. However, in a 1999 speech, Graham discussed his relationship with the late North Korean dictator Kim Il Sung, praising him as a "different kind of communist" and "one of the great fighters for freedom in his country against the Japanese." Graham went on to note that although he had never met Kim's son and current North Korean dictator Kim Jong Il, he had "exchanged gifts with him." In 2002, declassified "Richard Nixon tapes" revealed remarks made by Graham to President Richard M. Nixon decades earlier. Graham openly voiced his belief that Jews control the American media, calling it a "stranglehold" during a 1972 conversation with Nixon. "This stranglehold has got to be broken or the country's going down the drain," said Graham, agreeing with Nixon's comments about Jews and their influence in American life. Later, Graham mentions that he has friends in the media who are Jewish, saying they "swarm around me and are friendly to me." But, he confides to Nixon, "They don't know how I really feel about what they're doing to this country." These remarks were highly controversial, with Jewish organizations characterizing them as antisemitic. When the tapes were released, Graham apologized for his remarks, stating that "although I have no memory of the occasion, I deeply regret comments I apparently made ... They do not reflect my views, and I sincerely apologize for any offense caused by the remarks," and "If it wasn't on tape, I would not have believed it. I guess I was trying to please... I went to a meeting with Jewish leaders and I told them I would crawl to them to ask their forgiveness." According to Newsweek magazine, "the shock of the revelation was magnified because of Graham's longtime support of Israel and his refusal to join in calls for the conversion of the Jews." Most biographers state that Graham has always been careful to receive reasonable compensation far below what other television evangelists would later receive. Graham, along with his associates that he called the "Team," created in 1948 what one of them called, "The Modesto Manifesto," because they produced it in Modesto, California. They decided amongst themselves to avoid certain problems that gave evangelists a bad name. The first item on the list was a matter of money, to which Graham was sensitive, due to the practices of some unscrupulous evangelists. (The "manifesto" proceeded to note the dangers of sexual immorality, criticism of local churches, and exaggerated publicity.). The official biography of Graham is John C. Pollock's Billy Graham: The Authorized Biography (1966). Other helpful biographical studies include William G. McLoughlin's Billy Graham: Revivalist in a Secular Age (1960), Curtis Mitchell's Billy Graham: The Making of a Crusader (1966), The Reader's Companion to American History (1997), Gospel Communications Network (GCN), Time Daily (Nov. 95), and People (1997). In 1993, Graham said before a record-breaking crowd in Columbus, Ohio "Is AIDS a judgment of God? I could not say for sure, but I think so." After seeing letters criticizing that comment, Graham later said "I remember saying it, and I immediately regretted it and almost went back and clarified the statement," and "To say God has judged people with AIDS would be very wrong and very cruel." Though Graham claims to be a Southern Baptist his position regarding infant baptism is not in keeping with Baptist doctrines and practices. However, Southern Baptists recently honored the internationally known evangelist by placing a memorial statue in his honor at the LifeWay plaza in Nashville, Tennessee. Graham will not allow himself to be seen or photographed in public with his daughters (or any other women) without his wife, Ruth, present. He does not want to give any sort of impression of marital infidelity. Graham once said, "I fully adhere to the fundamental tenets of the Christian faith for myself... but as an American, I respect other paths to God." This was controversial as it showed that he thought that there were other ways to God other than through Jesus (the fundamental tenet of Christian faith). By this, some Christians saw him as not being a true Christian. Billy Graham has received the Congressional Gold Medal; the Templeton Foundation Prize for Progress in Religion; the Sylvanus Thayer Award for his commitment to "Duty, Honor, Country," and the Ronald Reagan Presidential Foundation Freedom Award for contributions to the cause of faith and freedom. He has received the Big Brother of the Year Award for his work on behalf of the welfare of children. He has been cited by the George Washington Carver Memorial Institute for his contributions to race relations. He has also been recognized by the Anti-Defamation League of the B'nai B'rith and the National Conference of Christians and Jews for his efforts to foster a better understanding among all faiths. For providing a platform during his events for many Christian musical artists — many new to singing and songwriting and others not so new — Billy Graham was inducted into the Gospel Music Hall of Fame in 1999 by the Gospel Music Association. On May 30, 1999, Graham was invited to give the pre-race Invocation at the Indianapolis 500. In 2000, Former First Lady Nancy Reagan presented the Ronald Reagan Freedom Award to the Rev. Graham. The award is only given to "those who have made monumental and lasting contributions to the cause of freedom," and those who "embody President Reagan's lifelong belief that one man or woman truly can make a difference." Graham has been a friend of the Reagans for many years. On September 14, 2001 in the aftermath of the September 11, 2001 attacks, Dr. Graham led a prayer and remembrance service at Washington National Cathedral attended by President George W. Bush and past and present leaders. In December 2001 he was presented with an honorary knighthood, Honorary Knight Commander of the Order of the British Empire (KBE), for his international contributions to civic and religious life over 60 years. Graham has been the minister to several presidents, including speaking at one presidential funeral and one presidential burial. Graham presided over the graveside services for former president Lyndon B. Johnson in 1973 and took part in eulogizing the former president with former Texas Democratic governor John Connally, an LBJ protégé and fellow Texan who was wounded in the assassination that made LBJ president. Graham also spoke at Connally's funeral and the funeral of former first lady Pat Nixon within one week of each other in June of 1993. He also spoke at the funeral of Richard Nixon in 1994. Graham was unable to officiate the state funeral of Ronald Reagan on June 11, 2004 due to recent double hip replacement surgery, which former President George H.W. Bush acknowledged during his own eulogy. Graham had been Reagan's first choice. Because Graham was hospitalized, the Rev. John Danforth, Missouri Republican senator in Reagan's day, officiated the funeral. Failing health prevented the Rev. Graham from officiating at the state funeral of former President Gerald R. Ford in Washington D.C. on January 2, 2007. On May 31, 2007, the 27-million dollar Billy Graham Library will officially be dedicated in Charlotte, North Carolina. Graham himself is expected to be present. President George W. Bush and former President Bill Clinton will also be present and both will speak at the event. "My one purpose in life is to help people find a personal relationship with God, which, I believe, comes through knowing Christ." "I have one message: Jesus Christ came; He died on a cross; He rose again. He asks us to repent of our sins and receive Him by faith as Lord and Savior. And if we do, we have forgiveness of all our sins." "If you find a perfect church don't join it: You'd spoil it." "After watching The Passion of the Christ, I feel as if I have actually been there. I was moved to tears. I doubt if there has ever been a more graphic and moving presentation of Jesus' death and resurrection." "Your mind cannot possibly understand God. Your heart already knows." "An orange a day keeps the doctor away. Oranges are a tremendous source of vitamin C."
"It is not the body's posture, but the heart's attitude that counts when we pray." "I urge everyone to examine themselves and renew their own hearts before God," he said. "Of greater import or concern than any tapes made in the White House, each of us must face the fact that God has 'tapes' that record not only our actions but also our thoughts and our intent." "I believe God has always had a special relationship with the Jewish people, as St. Paul suggests in the book of Romans. In my evangelistic efforts I have never felt called to single out the Jews as Jews nor to single out any other particular groups, cultural, ethnic, or religious." About Christianity and Judaism: "We have grown. The two don’t see the vast differences and hold the prejudices they did. People have friends across all kinds of lines." "God is like the wind: you can feel the effects of the wind but you cannot see it."